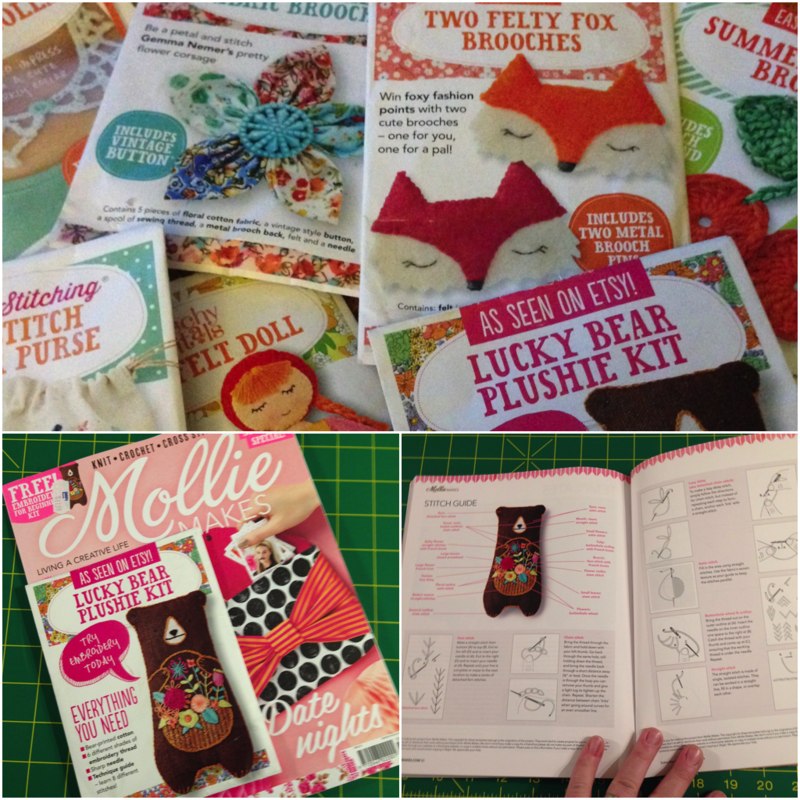 There’s this fantastic maker’s magazine out of the UK called Mollie Makes. I discovered it a few years ago and it’s become my monthly inspiration-indulgence-ritual: I go to Chapters where they hold a copy for me, pick it up, and then sit down with a coffee flip through adding a few/a lot of sticky tabs to things I’d like to try. Mollie Makes magazine cleverly includes a little free project, usually designed by another maker. But I rarely have time to make these tantalizing wee projects. So, a collection of colourful envelopes sit in a wooden box on the corner of my work table, waiting for a “quiet” moment. And then last year I completely ruptured one of my achilles tendons in an unfortunate me vs the stairs incident (the stairs won that round) and was couch-bound for a solid 2 months. And it occurred to me I could make my Mollie Projects! So I sat on my couch busy healing and making little projects I’d never otherwise attempt. It was actually very therapeutic! I now have a shelf adorned with an eclectic collection of Mollie Projects, which I thought I’d share here every Monday for a while – I’ll call it Mollie Mondays! 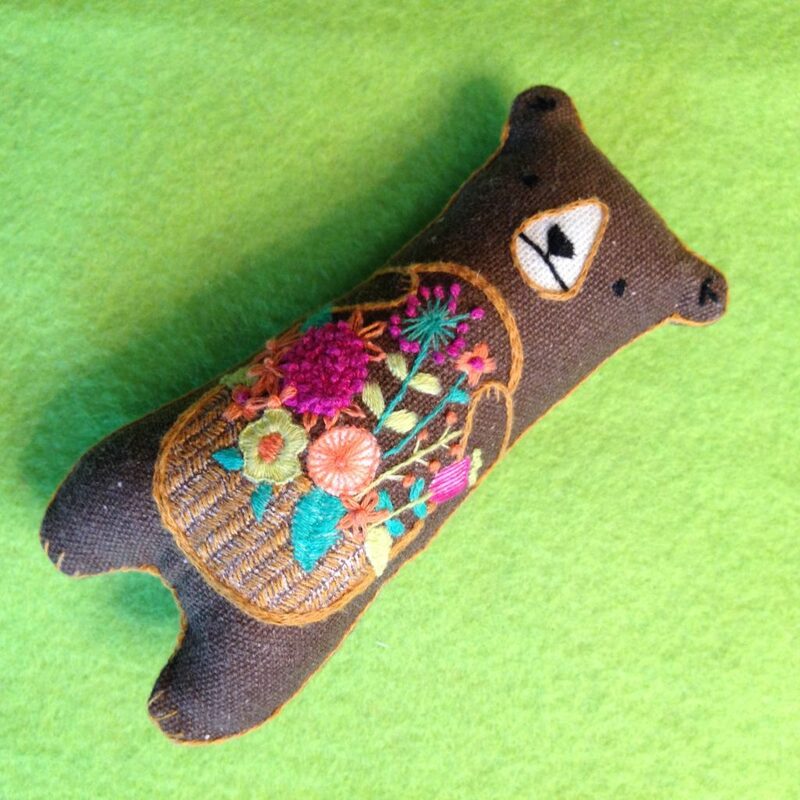 The first one I’ve got to show you is this sweet, bouquet-weilding Bear, designed by one of my favourites, Michelle Galletta and her Kiriki Press in Toronto. I’ve made a number of her little embroidered stuffy kits and I’ve loved them all. But it was extra special to get my Mollie Makes mag and see a Kiriki Bear project attached to it. Til next Mollie Monday … stitch well.